USD/CNY is currently trading around 6.5322 marks. It made intraday high at 6.5406 and low at 6.5008 levels. Intraday bias remains bullish till the time pair holds key support at 6.4899 marks. A sustained close above 6.5026 marks will test key resistances at 6.5407, 6.5580, 6.5858 and 6.6042 marks respectively. Alternatively, a daily close below 6.5026 will drag the parity down towards key supports at 6.4899, 6.4639, 6.4378, 6.4125 and 6.4017 marks respectively. PBOC sets yuan mid-point at 6.4893 / dlr vs last close 6.4950. 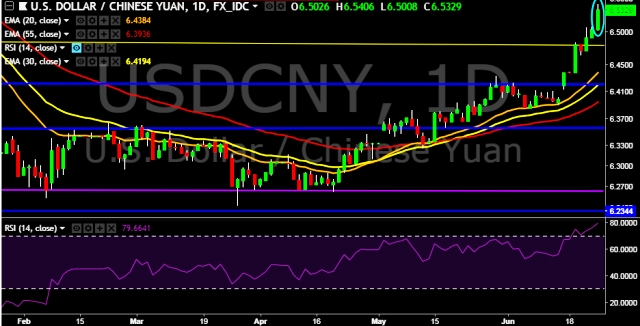 We prefer to take long position on USD/CNY around 6.5250, stop loss 6.5000 and target of 6.5580/6.5749.